New PolarSafe EVA Ice Buckets and Pans are designed for benchtop chilling needs, especially cryogenic applications. They do not sweat or leak, and no puddles of condensation or cryogenic media will accumulate onto the workspace. 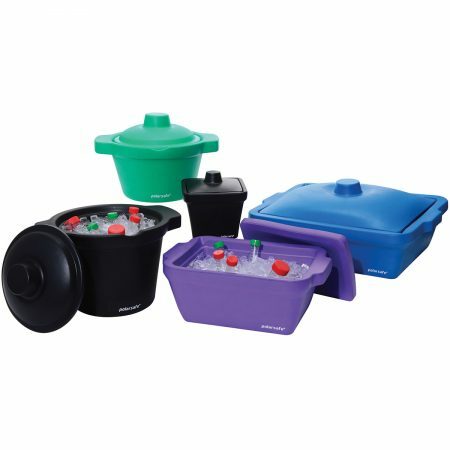 The buckets and pans are made from ethylene vinyl acetate (EVA), a thick non-toxic foam compatible with ice, dry ice, liquid nitrogen, alcohol and saline solutions. The ice buckets and pans also feature ergonomic handles on the base and lids making them easy to pick up even when wearing cryogenic gloves. Convenient pour spouts provide easy use and cleanup. Stackable construction provides neat and compact storage. The buckets and pans area available in a variety of sizes and colours.